The limited podcast series where I talk to indie creators about reading, making, and selling comics returns for a new installment recorded over the course of driving to and from Stockton, CA for the inaugural StocktonCon Winter. Joining me again is Kyrun Silva of Taurus Comics, and the conversations naturally focused on the strange space that indie creators inhabit, that realm between fan and professional and how those waters can get muddied, especially when it comes to reading and respecting creators from your childhood (there is a lot of Rob Liefeld talk in these conversations) to meeting your heroes as a creator in your own right. This, as always, was a lot of fun to record and edit together (I even wrote some new music that pops in the middle of the episode). It’s always inspiring and, in a way, cathartic to just talk about the business of comics with a person in the same position. I imagine it to be the kinds of conversations a bunch of creators would have when sharing a studio. 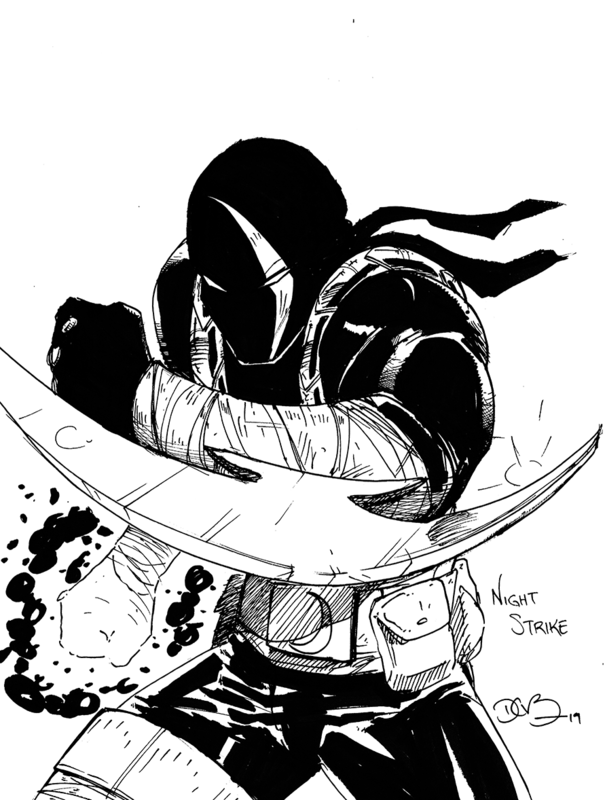 Just to get it out of the way, here is my #LiefeldPersona (to find yours, just type “Liefeld Persona” into a Google image search and you’ll find the chart): NightStrike. In hindsight, I could do better––to “Liefeld it up” a bit more––but it totally works as an homage to ’90s excess. 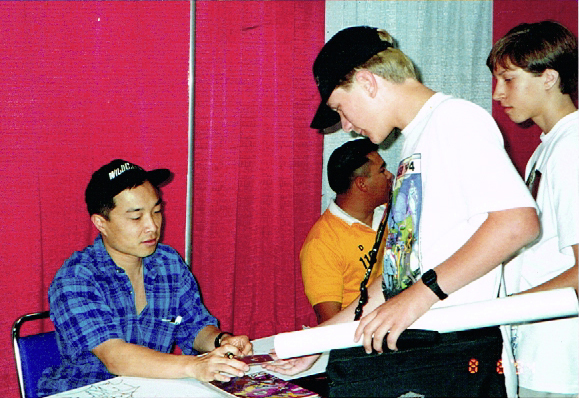 In the episode, I talk about getting stuff signed by Jim Lee. While I couldn’t find the signed card case, I do have a photograph of me showing him the case, moments before tragedy occurred and he put pen to plastic. Presenting Jim Lee with the mystery card. And, for the sake of completion, here are the books that I got signed by him, as they hang on a wall behind where I keep my inventory and convention supplies. 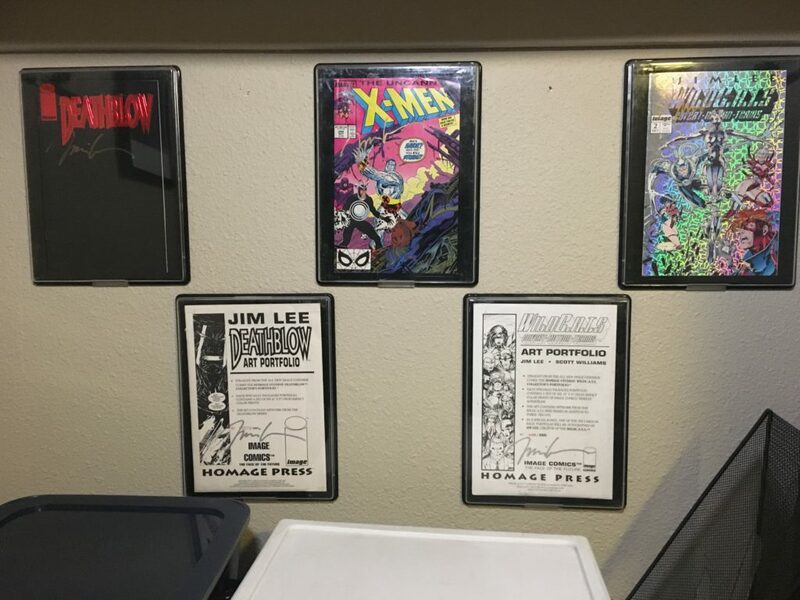 The books Jim Lee signed in ’94. Top (L-R): Deathblow #1, Uncanny X-Men #248 (erroneously reported as #249 in the episode), and WildC.A.T.S #2. Bottom (L-R): Deathblow Art Portfolio, WildC.A.T.S Art Portfolio (I have no idea what’s in them). Again, the conversation is hosted by my weekly nerdy & geeky discussion podcast, A Podcast [ , ] For All Intents and Purposes, but I’ve embedded the audio here so you can listen to it on the site. These are a lot of fun to do and I could talk with Kyrun forever. In addition to more conversations with him, I’m excited to get the chance (and courage) to talk to even more indie creators about being fans, creators, and vendors.